Spinach was first cultivated in Persia several thousand years ago. From there it made its way into China, approximately 1,500 years ago and then spread to Europe several hundred years later. Today it is cultivated worldwide and has become a staple food for many. It’s not hard so see why it’s so popular: it is readily available, cheap, easy to grow and quick and easy to cook. The benefits of spinach are many. Rich in vitamins, minerals and nutrients, it contains no fat or cholesterol and is high in dietary fiber. One cup of spinach contains just seven calories. Like all leafy green vegetables, spinach is rich in nutrients, but is particularly high in Vitamin K. It is also an excellent source of vitamin C if eaten raw, as well as vitamins A and E, niacin, zinc, thiamine, vitamin B6, folate, calcium, iron, magnesium, phosphorus, potassium, copper and manganese. In other words it is a nutritional powerhouse. Few foods offer more benefits than spinach. It tops the list for the world’s healthiest vegetable and it’s not hard to see why. This nutrient rich leafy green contain a range of phytonutrients such as carotenoids (beta-carotene, lutein and zeaxanthin) and flavonoids. These flavonoids and phyonutrients contain valuable anti-inflammatory and anti-cancer agents and provide antioxidant protection. But they also do much more than just help prevent cancer. The antioxidants in spinach help strengthen and restore skin, preventing wrinkles, as well as protecting the skin from harmful UV rays from the sun. Spinach is very helpful in decreasing inflammation, a condition linked to a host of diseases such as Alzheimer’s, arthritis, type 2 diabetes, heart disease and osteoporosis. Reduced inflammation in the digestive tract has been associated with the flavonoids and carotenoids found in spinach. Spinach is an excellent source of other antioxidant nutrients such as vitamin C, vitamin E, vitamin A and manganese, as well as zinc and selenium, and helps lower the risk of atherosclerosis and high blood pressure. The carotenoids, lutein and zeaxanthin have a role to play in the prevention of eye problems such as age-related macular degeneration. Spinach contains high levels of vitamin K which is essential for maintaining bone health. Other bone-supporting nutrients such as calcium and magnesium are also present. 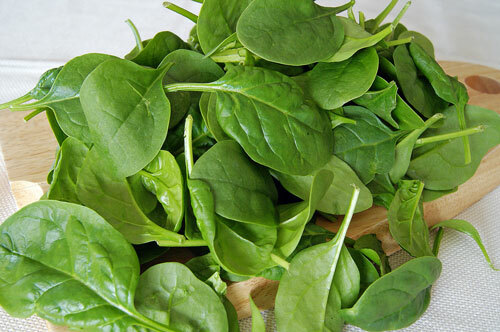 The folate present in spinach helps to maintain a healthy cardiovascular system. It is also rich in iron, which can boost your metabolism when eaten regularly. Iron is an essential component of haemoglobin which carries oxygen to the body and helps to alleviate fatigue. Spinach contains a compound called oxalic acid. Oxalates occur naturally in plants, but when they become too concentrated in the body, they crystallize and create problems such as kidney stones. Those who are susceptible to kidney stones should limit their consumption of spinach. Oxalates can also interfere with the body’s absorption of calcium and iron. One way to overcome this is to pair spinach with foods high in Vitamin C.